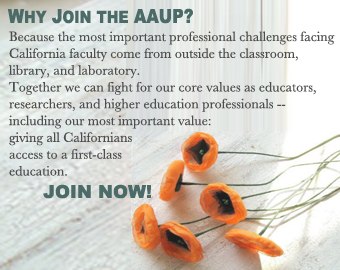 The AAUP’s origins can be traced all the way back to an unfortunate incident that occurred in California at the turn of the previous century. In 1900, noted economist Edward Ross lost his job at Stanford University because Mrs. Leland Stanford disapproved of his views on immigrant labor and railroad monopolies. That incident rankled many in the profession and was not forgotten by Arthur O. Lovejoy. Some fifteen years later, Lovejoy -- along with fellow philosopher John Dewey -- organized a meeting at Johns Hopkins University with the intention of forming an association to protect academic freedom. In its early days, membership in the Association was restricted to faculty and was extended by invitation only. Over the years, however, the Association has grown and adapted with the profession. The AAUP now boasts some 45,000 members and includes part-time and emeriti faculty, graduate students, librarians, counsellors, and other academic professionals. The AAUP remains the leading organization primarily dedicated to protecting academic freedom in America’s accredited institutions of higher education. Largely through the work of the Association’s many standing committees, faculty determine the principles of the profession and the procedures which best protect those principles. The AAUP speaks with the voice of the profession. The AAUP’s mission is to safeguard academic freedom, to define values, standards, and best practices for the profession, and to ensure higher education's contribution to the common good.